Dendritic cell (green/blue) in contact with a T-lymphocyte (yellow) infected with HIV (Human Immunodeficiency Virus) particles (red), computer artwork. Dendritic cells, a type of white blood cell, play a role in the body's immune system by recognising and phagocytosing (engulfing and destroying) pathogens. HIV causes AIDS (acquired immune deficiency syndrome). The virus consists of an RNA genome, surrounded by an icosahedral (20-sided) protein nucleocapsid (coat). The whole virus is enclosed in an envelope derived from the host cell's plasma membrane. 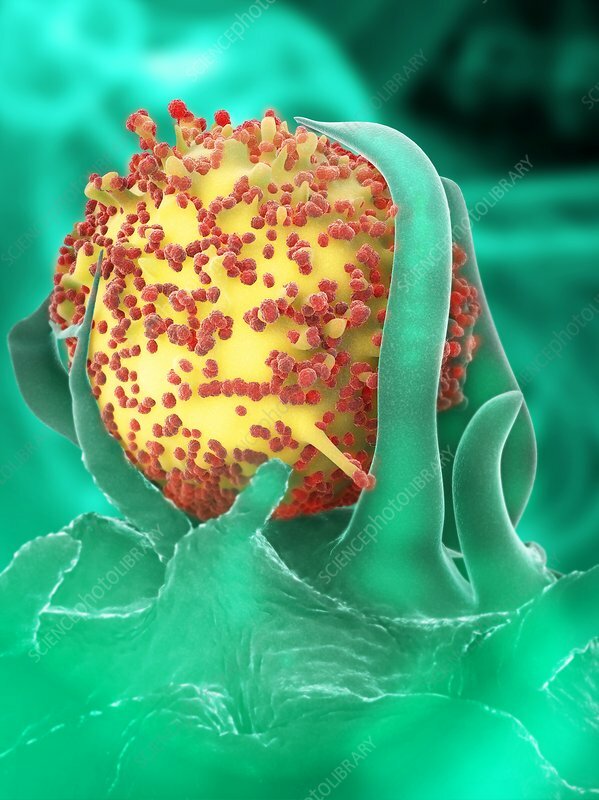 When the virus particles leave the host cell (yellow) they kill it, leading to a very weak immune system.